The famous Swiss watch brand Graham pleasantly surprised the connoisseurs of luxury chronographs by the new model Swordfish Booster Black from the famous line Swordfish. The imposing three-button watch is dressed in black magic. The round case in diameter of 48 mm is made of stainless steel and coated with PVD-coated in black. On the left side of the case there are installed the crown and regulator buttons, decorated with elegant pattern Clous de Paris. The steel bezel is covered in black PVD-coated finish. On the front side the case is equipped with a flat anti-reflective coating sapphire crystal. The transparent case back is a smoked sapphire crystal and screwed to the case in order of reliability. 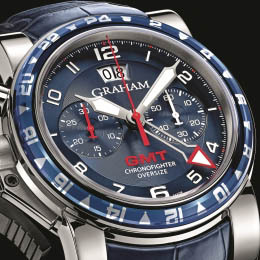 Timing functions are displayed on the black dial on a 30-minute and 12-hour indicator with blue hands and blue central second hand. Time is indexed by the central hour and minute skeletonised hands, covered with black fluorescent material SuperLuminova. The black indicators are increased in size by 15% per cent. Temporary indexes 6 and 12 are made by massive Arabic numerals and also covered with black luminescent material SuperLuminova. The indicator hands of the chronograph are made in several versions: a grey, yellow and red fluorescent substance SuperLuminova. The novelty is designed on the base of the manufactory caliber G1710, sophisticated with chronograph function and shockproof system Incabloc. The mechanism is paved by the 34 jewels and has a 48-hour power reserve. The watch water-resistant is up to 100 meters. The integrated into the case strap is made of genuine black rubber. The model price is 9900 CHF.